The horticulture department’s plant sale Wednesday drew not only American River College students but interested customers from the surrounding community. Products for sale included bedding plants, vegetables, outdoor shrubs, tropical foliage plants and herbs. Students from the Plant Propagation and Plant Production, Facilities and Sales classes are in charge of helping customers find specific plants and completing transactions. A greenhouse located in the interior of the plant sale housed plants that weren’t for sale and plants that the horticulture classes experiment on. “The plants that aren’t for sale are used to propagate. We also have cuttings and leaves that we experiment on by putting hormones in them,” said Beverley Peets, a horticulture major and student who was greeting patrons at the sale. “We put a fan on the plants when they’re first growing to simulate outside conditions. Debbie Flower is the Horticulture professor in charge of the plant sales. The plant sales don’t only attract students and employees of ARC, they also attract members of the community. Jared Calabrese, a local in the ARC area, found out about the plant sale by spending some of his free time on campus. 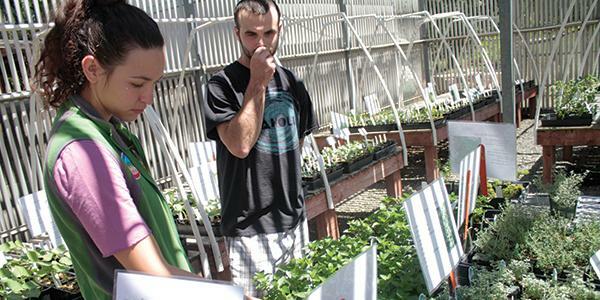 Students from Horticulture 312 and 316 aren’t just learning the business side to the plant industry, they’re also learning horticultural techniques. According to O’Neill, a line for the plant sale formed at 8:30 a.m. and was so long that the line extended outside the area of the entrance to the plant sale. Be the first to comment on "Success of horticulture department’s plant sale continues"